It’s best to approach Avatar as if it was the beautiful awe-inspiring result of a megalomaniacal potentate, like the Taj Mahal or the Forbidden Palace or the Bellagio Hotel. The irony of a $300 million dollar project (with tie-ins to produce countless plastic figures with McDonald’s) that celebrates a nature-loving society prevailing over a greedy corporate one hasn’t been lost on some of my more perceptive friends (Menton 2009). The environmental impact of such a colossal undertaking undermines the message of the movie. And that doesn’t figure in the inevitable explosion of materialistic consumption of video games, action figures, key chains, and probably a new wave of consumers hungry for 3D TVs. Yet what can I say. You have to watch this movie. And you have to watch it on an IMAX screen in 3D. For the same reason people visit the Pyramids or Angkor Wat. Not only is it a fascinating work of art, it’s a game changer. It will probably change the way blockbusters will be made. On a more analog scale, I felt the same way with James Cameron’s earlier epic, Titanic. Like Titanic, I went in ready to critically watch the movie like I always do and I was wary of the hype. By the end I was so absorbed in the film that I entered that rare cinematic nirvana of total escapism, of being lost in the story. The basic plot isn’t particularly original. It’s the old story of the evil tag team of a corporation and the military attacking a noble tribe with their good scientist allies. It’s simplistic and idealized but it’s also compellingly archetypal. And there are enough twists and variations on the formula to be thoroughly engrossing. What makes the movie really compelling, however, is the richly detailed imagined world, Pandora. The animals and plants were a mesmerizing safari. The wonder of constructing a totally new world reminded another one of my perceptive friends of the works of Hayao Miyazaki (Shibayama 2009). So I dedicate the rest of this review to pointing out similarities between Avatar and the movies of Miyazaki. 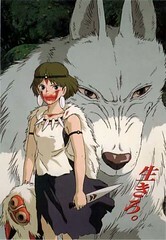 The premise of industry versus nature was brilliantly treated in my favorite Miyazaki movie, Princess Mononoke. In it, one of the main characters is a strong and fierce young warrior woman who battles a gun manufacturer who has denuded the forests. Strong young women and girls are a theme throughout Miyazaki films. The other main character is a courageous young man, an outsider who helps mediate between the two worlds. I also noticed that the eyes of the native Pandorans, the Na’vi, were eerily like the eyes of the Forest God in Princess Mononoke. Another similarity is that both movies had sacred groves in which people were healed in the same way, with tendrils from the trees attaching themselves to the sick person. 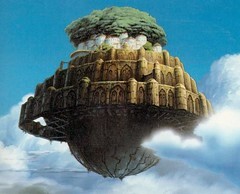 In Miyazaki’s first major film, Laputa, a floating island features prominently in the film. Avatar had an archipelago of them. A massive tree is the central feature of Laputa’s island, just as a gargantuan tree houses a whole tribe in Avatar. Laputa also has a young boy and girl as the heroes of the story, bravely fighting against a militaristic society employing giant robots. Large robots also figure prominently in Avatar, except these are a lot like the robots in the Matrix series, with a human pilot inside. 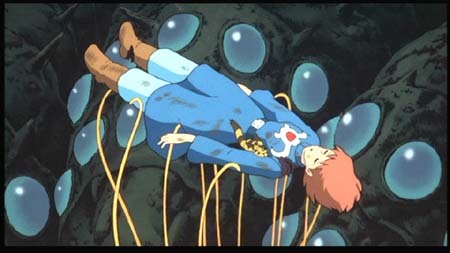 Flight is a major theme of Miyazaki films, but his creations tend more towards the mechanical— fantastic airplanes, dirigibles and gliders like the one the eponymous heroine in Nausicaa uses. In Avatar, the Na’vi fly on something much cooler, dragon-like beings. Also in Nausicaa, the young courageous heroine helps her tribe of wind farmers fight against a ruthless militaristic occupying government. Is it too obvious to point out the blueness of her outfit strangely similar to the hue of the Na’vi? One of the more interesting notions in Avatar is that all the planet’s inhabitants are plugged in to a central planetary consciousness. They can literally plug themselves in, tendril to tendril, as if connecting to the internet, and access all the memories of past generations. I noticed a similar plugging in to a communal consciousness of the messianic Nausicaa, who is able to communicate and placate the creatures of her world. It’s probably no accident that there are so many ties between the two directors. Any serious filmmaker would be familiar with Miyazaki’s works, and I’m confident Cameron was influenced and inspired by him. I’m wholeheartedly for good art begetting good art so I’m happy to see Miyazaki’s influence in as many films as possible. I haven’t seen any of these films. Your review convinced me that they are worthwhile seeing. The 3D aspect of Avatar put me off, as these types of films usually leave me feeling physically jarred. I might have to wait to see it once it’s on DVD. Good art has always been a starting point for other good art. I believe one reason for this is our connected consciousness. The more connected we are, the faster the flow between ideas. However, I think the best art is produced when the artist is able to disconnect and reflect for a period of time in order to create something fresh and original. oh yes, i think you would definitely enjoy the miyazaki movies. they are quite nature-centered, and women-centered. and the details are amazing. avatar is a hollywood blockbuster. and that turns a lot of people off, but i think you’d enjoy this one too. let me know what you think of them. 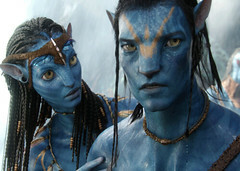 Great article on Avatar.. I just read the Avatar Movie Review over at MVP and they seemed to love it, so ill be seeing it this weekend. I like Miyazaki’s works a lot and have watched them all. I am from Hong Kong. The first time I saw Avatar, I felt like watching a remix of many Miyazaki’s works and Star Wars. Sorry if this sounds rude, but the ‘visual designs’ and atmospheres between Avatar and Miyazaki’s works are blatantly similar. This won’t be coincident since it’s not just about one work, but several works of Miyazaki’s being combined and reworked into one. I don’t how if the film company has to pay Miyazaki for this? i certainly agree about the similarities. i wonder if cameron has mentioned those influences. but i think great art is often imitated. that’s why it’s great. there’s a spectrum of course. on the one end, there’s just plain old copying, plagiarism. and on the other end, there’s using the influence and transforming it into something quite different. as long as the influence is acknowledged, why not take great art and make more from it? Wind, I agree with you that new creative works always to various extent build upon previous ideas, themes, and ‘innovation’. Matrix, is obviously ‘inspired’ by ‘Ghost in the Shell’, which is also inspired by many ‘cyberpunk’ fictions. 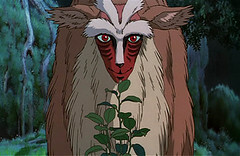 I don’t have anything new to add, but would like to point out that, as Nihan, when I saw Avatar (and liked it) I actually told my girlfriend that it surely was inspired in many ways by Mononoke hime and Castle in the sky (remember also the cube?). And I do think that Cameron ought to acknowledge this FACT. I too thought no one knew about this, but now I see it is pretty obvious. I really like the Avatar 3D film, particularly the story line, not only it brings a totally new sensation however eye opening thoughts of humanity. 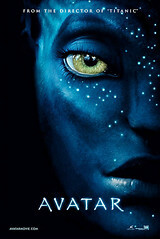 I heard the New Avatar 2 is comming soon, can’t wait to watch it again…! I really like the Avatar 3D movie, particularly the story line, not solely it brings a completely new sensation but eye opening thoughts of humanity. 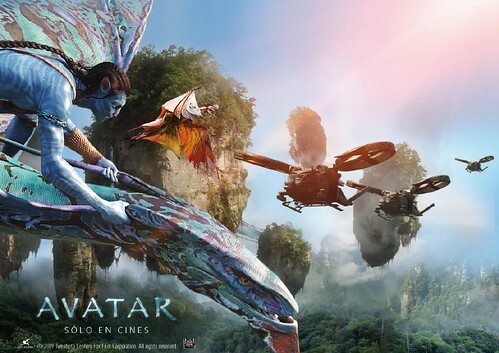 I heard the New Avatar 2 is comming soon, can’t wait to see it again…! I have just watched Avatar on DVD at home, so no messing around with giant screens and 3D, you see the film for what it is. And I have also seen all Hayao Miyazaki’s films and loved them. And I do absolutely agree: Cameron has seen Princess Mononoke and Laputa and has learnt from them, and this is his response. And a very good response. I was not expecting to be so transported by a $300 million Hollywood blockbuster, but I was crying and laughing and cheering like a little boy (which I still am inside, in spite of being over 60). Hurrah for good influences. I would add one further Miyazaki reference: the all-important Tree of Souls derives from Totoro’s giant camphor tree. when i first saw avatar, i loved it, and then i found out about miyazaki films and realized there were heaps in common. i understand that teh themes in miyazaki films arent copy righted or any thing, but i think James cameron should at least acknowledge that some of the things, ideas, scenes, colours and such are infact very similiar to certain myaizaki films. And has any one else noticed, but it hasnt just been james cameron who has ‘stolen’ a thing or two from miyazaki? look at some of the newer disney films to date, and see how many similarities you can find in them. Atlantis: the lost empire, looks awfully similar to laputa, even though the story of atlantis is much older, disney’s reworking had a lot of scenes that looked like they belonged to laputa. once something is out in te open i.e a book, movie, show, etc, it is sort of like ‘public property’, any one could come along and take it (unless you’re george lucas and copy right every single little name), but really, something as major as avatar taking so mnany things from each of miyazaki’s films, why not acknowledge it at least? also, has any one heard about james cameron saying he wanted to do this project back ten years ago? but was waiting for teh right technology. well, that’s a plausable answer, but what if he was just waiting for the mononoke craze to die down? and hope people would forget about ti by the time Avatar was released in 2009. this sounds corny, but i feel ‘betrayed’, at such a thought. but doesnt any one else agree? I recently gorged myself with Miyazaki, a friend gave me the collection. As I went through Nausica, it was so much like Avatar that it wasn’t even funny, even to the detail of the design of the evil aircraft… And yes, lots of other inspiration from other movies, Miyazaki has so often a huge tree as central to his stories. But a huge difference: as portrayed so elegantly in Mononoke, and completely missing in the Hollywood product, when the quest for resources clashes with nature there is no happy middle, and it gets worse when both sides are right, both sides have goodness in them. My wife and I noticed, too, how many themes and ideas from Miyazaki’s movies re-appear in Avatar. Which is not a bad thing; I love them all 🙂 Nice article, good work!